Discussion in 'iPhone and iPad Games' started by TheGreatWhiteApe, Jun 7, 2015. 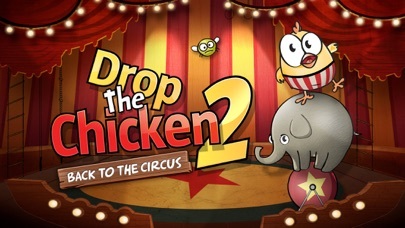 Drop The Chicken 2 has just launched in New Zealand and will be available today worldwide. Free ! For a limited time only! 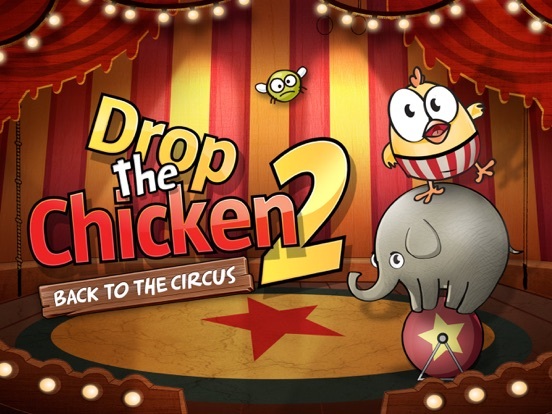 Drop The Chicken 2 is a super cool, fully animated, addictive, and challenging puzzle game. 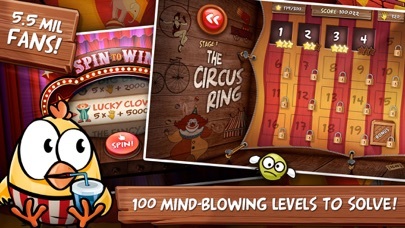 THE STORY Our hero 'Chuck The Chicken' has been captured by the circus's evil monkey ring master and he must perform his way through each of the levels to win his girlfriend back. YOUR MISSION Your mission is to cunningly plan Chucks journey to the dive pool while catching all the bugs along the way. 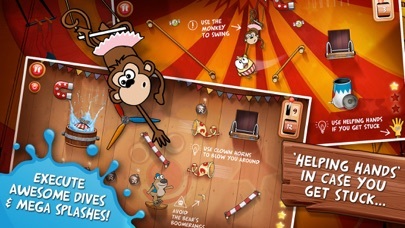 Drag the acrobatic tools into place, swipe the switch and watch Chuck bounce off elephants, shoot out of cannons, do a trapeze act with monkey's and fly around the levels like a master acrobat. Use a host of awesome new tools and animated circus characters in your effort to solve the levels and save Chuck and his girlfriend! Think before you drop and be sure to avoid the bombs, fire torches, lions and unicycle-riding, juggling bears along the way. It's not going to be easy! This is one of the most challenging and hilarious puzzle games on the app store. There is no time limit, just awesome puzzles and weeks of entertainment! KEY FEATURES • Exclusive to iOS and Apple • 100 tricky puzzle levels over 5 stages with more soon to come • 5 bonus levels & hidden easter eggs • Game Center, leaderboards & stacks of achievements • Great for all ages, easy to learn • Very addictive, brain training game play • In-game 'helping hands' in case you get super stuck • Do awesome dives & huge splashes • Really challenging & great fun • Absolutely NO ads and NO restricting IAPs. This is a premium game title and we care about our fans (and chickens). 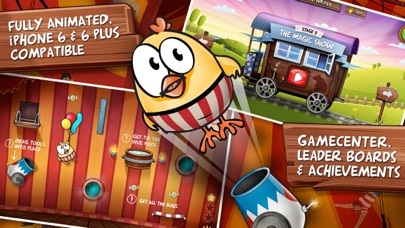 BONUS LEVELS Finish all the levels in a stage to open the bonus levels where Chuck has the chance to have a feeding frenzy and gain some valuable extra points. UNIQUE CERTIFICATE OF ACHIEVEMENT Finish all the stages and levels, and receive a free 'Certificate of Achievement' with your name and score and go onto the ‘Drop Master’ leader board. We hope you enjoy the game!!! 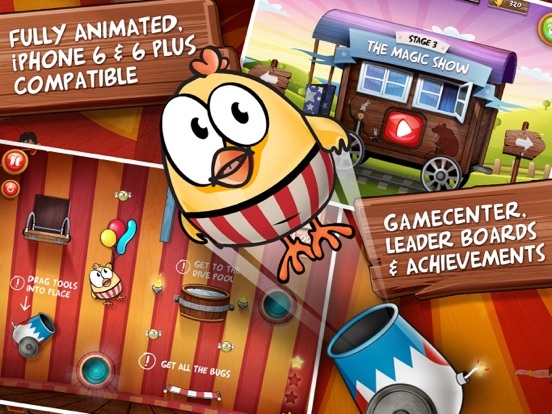 Drop The Chicken 2 is a super cool, fully animated, addictive and challenging puzzle game. 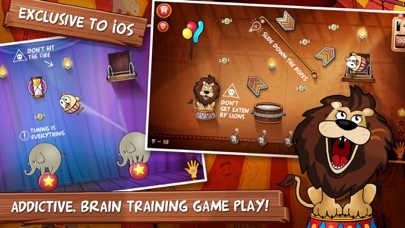 This sequel has been built over 2 years by 2 really dedicated guys and is exclusive to iOS. 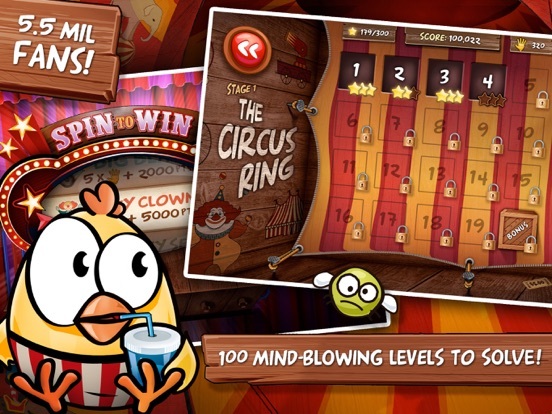 Our hero 'Chuck The Chicken' has been captured by the circus's evil monkey ring master and he must perform his way through each of the levels to win his girlfriend back. 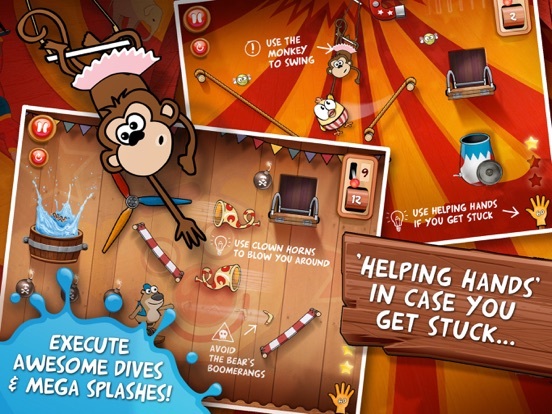 Use awesome new tools and animated circus characters to cunningly plan Chucks journey to the dive pool while catching all the bugs along the way. 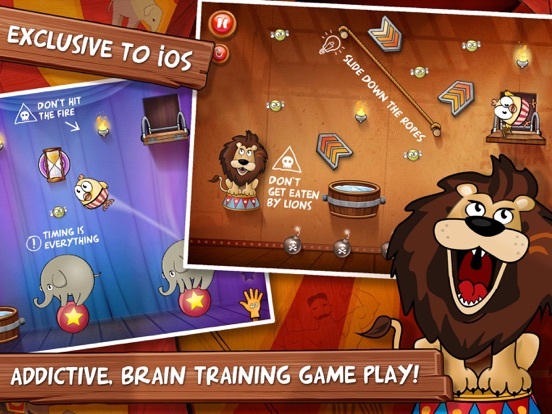 Drag the tools into place, swipe the switch and watch Chuck bounce off elephants, shoot out of cannons, do a trapeze act with monkey's and fly around the levels. Be sure to avoid the bombs, fire torches, lions and unicycle-riding, juggling bears along the way. It's not going to be easy! This is one of the most challenging and fun puzzle games on the store. There is no time limit, just awesome puzzles and weeks of entertainment! Thanks for checking the game out, we've worked crazy hard to make it amazing, hope you enjoy it! Below are some screenshots from our game. Love to hear what you link of the look and feel of the game. buy and download now ... this's my favorite games ! Wait for this so long ! Now , Not yet on US but available on asia + newzealand Store ... maybe you have to wait for a new day 6/8 . this item is temporarily unavailable in appstore. on NZ and any store in asia. Hi Redribbon, the app is now available in Australia and New Zealand get it while it's half price! The apps launch date in Monday June 8th, so if it's Monday where you are it will be available to download. So good to see some fans already on this thread, we really appreciate it guys and appreciate the feedback. I have fun with the game, it's a big step up when you compare it to the first game, congrats. Really like the overal look of the game. There Seems to be a problem with the scoring system, I think you can get 9000 points max for a level right, so for the first chapter you can have 20 times 9000 points is 180.000 points correct, Well I have 181. 600 and I am no hacker. Strange is it or am I missing something. For a puzzle game, it has a strange time component. You lose points already from the moment the curtains *start* to open, that is when the clock starts ticking. Then the time you take to position the elements also counts. The clock stops when the chicken reaches the bath. Better choice for a puzzle game would have been to start the clock the moment you drop the chicken. After all, isn't that the name of the game! Also, if I two-star a level, and then retry it to make a three-star attempt, all the elements are set to their default position again. Annoying. And there is a "spin to win" wheel at the end of an episode of 20 levels, where you win a random(!!) number of points. How stupid is that for a puzzle leaderboard???? That's where you probably got your points over 180k, Roger. The game's free just a week after its release. It went f2p or is it just some sort of sale? Thanks for clarifying. I downloaded it and have played a dozen levels. It has IAPs (hints), but does not seem to be f2p at all and I am really enjoying it so far. I would have been happy to buy this one. The scoring system is a bit more complicated than that. The score is derived from a few factors including the the time it takes to place objects, how many objects you move, how many drops you take to get the best solution and how many bugs you collect. There are standard values you can hit by say getting the solution within the drop target, but you also get small bonus's for using less objects, getting to the solution in less drops than the drop target shown on the switch, and not using hands to get the final solution. I'f you want a perfect score or as close to the best score possible try to move the objects into place quickly and complete the solution in a single drop. There are break points at minute intervals that lower your score slightly, or give you bonus's. We want to make the scoring system as detailed as possible to reward those players that replay to improve their score, but at the same time, not make the bonus's for quick solutions, or smart solutions to be so huge that people that complete every level with 3 stars still get a fairly high score. Hope this makes sense. We put a lot of thought into making the scoring as fair as possible, and we studied games like Cat Physics and Cut The Rope as a guide for scoring games with similar game play, and also tried to add a level of nuance to ensure that players competing against each other all don't automatically end up with the same final scores, but scores based on how well the completed each solution. We had really bad luck with the release of the game. There was a glitch with apple that wouldn't let people download the game for the first day, took us 8 hours on the phone with apple support to get it fixed, and we had all our marketing spend on that day and nobody could download it. We then had 3 top review sites pull out on doing reviews because they couldn't download the game to try it out. We had pocketgamer pull out on doing a review 2 hours before apple fixed the glitch, but by then they had moved onto another game. The game has done terrible as a result. We did O.K.in China, Japan, Germany, France and Italy but it has dropped off the charts after a week everywhere else. We set it free for a day as part of a promotion in hopes of getting some users on it. Apple completely ignored the game for any features anywhere, so other than setting it free occasionally or putting another marketing spend on it there isn't anything we can do now. Bit of a waste of 3 years work, glad some of you guys enjoyed playing it, just wish more people had had a chance to check it out.